I just needed to renew my passport. A lot of paperwork to fill out and it’s really tough to write—my mother obliged me, I just needed to sign my name. But my signature LOOKS LIKE A FORGERY. An extra form needed to be sent to explain why it IS legit. but I find it’s like trying to work without the right tools. You might be able to do it, but it’s w·a·y harder! I thought I’d tackle framing out the new kitchen chalkboard. Ordinarily the simplest of jobs. Now an awkward task AND keep safe! ◊ I wanted to router a picture frame profile to the inside, and just soften/round over the outside edge. ◊ I also needed to run the boards through the table saw creating a thin rabbet enough to lay over the chalk board, with the rest to lay flat on the wall. ~I pre-primed and it’s up—now I just need to lightly sand, putty any little gaps, then paint. What’s next is to hang coved molding across the top for that extra finish, and create a chair rail for the bottom (over the brick). And THAT will actually tie into another project to come. I know it all seems pretty fussy for such a simple finish, but, the devil is in the details! the finger is giving me a true run for the money. You’d be surprised at how difficult the simplest and most innocuous things have been to do! Plus~ a setback has me sporting a special splint now (that is painful at times). All I want for Christmas is a healed & straight finger—pretty please! And THIS is what I’ve been up to! It’s not a BIG change—but it has some BIG impact! 1st- My mother has ONLY agreed to let me COVER OVER her beloved mural –BECAUSE- I had a fun idea for her to focus on. A 4ft x 10ft chalkboard to draw out our family tree! Our British and German maternal families! She’s traced us back to the 1600’s so far, and this should make it easier and more fun to share it all with us! 2nd- I had the j-box moved so the chandelier will hang centered over the table for the first time E V E R. AND, I hung a “new” chandelier! 3rd- I deleted the old wall phone. It was a fun thing back in the 70’s, but time has moved on. It held the phone books in the side and had a chalkboard front for messages. It’s now for sale at the antique mall should you be interested. I got some help hanging the hardboard and wasted no time painting. But the color was mis-mixed! A purple-y periwinkle…NoNoNo! Then it was too bright and “yellow-y” a blue, so I had a gray’ish color mixed and played with the two till I got the lighter blue-gray I actually wanted! The banquette-bench and table are moved to the left to clear the deck door swing when it’s open (which is a LOT). 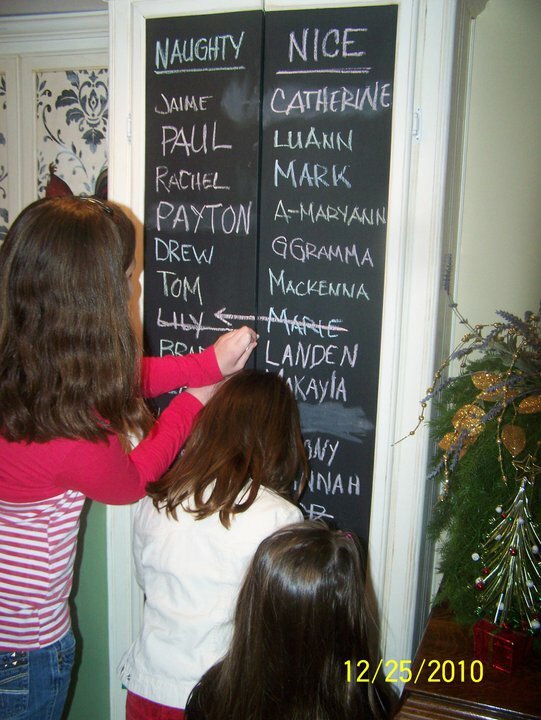 You can kind of see that MOST of the chalkboard is primed—THAT’s an exhausting exercise! I love how the color is faded just a bit more by the priming! The chandelier is vintage metal with a great patina, and yes, I added white doves to each arm for Christmas! LASTly— I have to frame the whole chalkboard. I have the wood and crown molding for the top, but, operating a saw is still iffy with my finger. I bang the poor thing into just about everything….dah! Oh yes— one more thing to share! Many years ago I bought an old beauty salon chair at auction for $5. I reupholstered it and used it in my master bath while I was getting myself together for the day! Yes—felt a little bougie! I’ve put it in mom’s kitchen. I’ve seemingly become her hairdresser and it’s inCREDibly handy to raise/lower as needed -AND- it becomes a booster chair when little ones come over! Truth be told- the bigger ones fight over it too! Whew! That was a loooooong post—sorry! My mini-me came to spend the night! We did an assortment of goofy auntie-niece activities, including watching the old movie Clueless! Day 2, after we finally got up and moving, we blew up the inflatable kiddie pool (with the air compressor) and filled it with the garden hose (and many pitchers of hot water). We laughed that if we had to do it all manually, it might be finished—next week! Aleigha was such a help—we weeded! All day! Thank God she loves me. Well, actually—we rotated weeding some, then wading in the pool. After lunch we also threw in a painting project she wanted to play with. It was a fUn day! 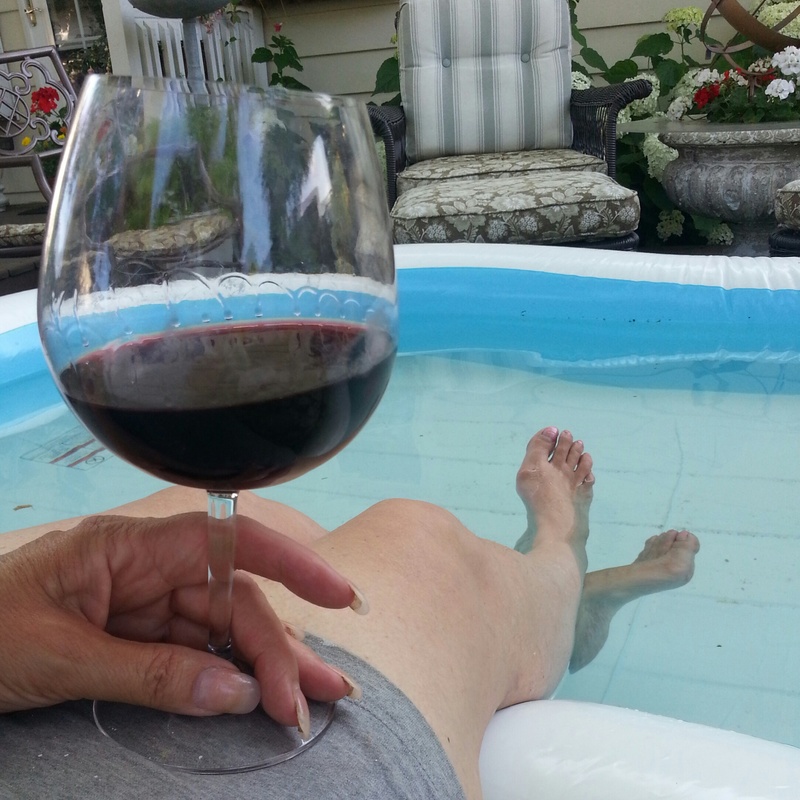 All the “pool time” seemed to be exactly what my ankle needed and is SO much better today! Who knew! Here’s Aleigha’s project—it’s something she saw on pintrest. Boy did I do some searching to find the origin of these photos—they’re all over pintrest with NO credit to the person who did it (sad). …but I had her peel them off to cut out the shape with a scissors, I thought it would be safer for her than using a knife. I suggested she place the jars upside down to paint…so paint over-spray wouldn’t go inside the jars, and I thought it would be easier than trying to both hold and turn the jars. She sprayed 3 coats—and we went back to our “weeding & wading” in between each! After both jars had ample time to dry, we “primed” the chalkboard paint and THEN we took off the tape. Her mom came to pick her up before we could finish and decorate, so we’ll play with that next week! The finished jars at left are from Alexandra at LOVE.HEART.ALWAYS. and this was my niece’s inspiration! from The Antique Farmhouse or Decor Steals? Well, at least my own interpretation of it. The following are just 4 examples. . . knockoffs. . . I saw this Decor Steals shelf during winter. Thought it was so simple and nice— and an easy project! So I tabled it for the future. So now you see the root of THIS project! ; D But mine has dimension instead of being flat. And unfortunately, I never took a picture of the finished, multi-layered-painted, distressed, and waxed finish before it sold at the market! -just SO crazy…but can you picture it ?! –so I made my own to use as a Christmas card display! Although I made mine 6ft×1ft. Cost, $zero. I used leftovers. After Christmas, the cards came down & school pictures of the kiddos were pinned to it. At the last minute, I distressed mom by stripping it off the wall to take with me. It sold -of course- and I need to make a new one for her now! I played around with a couple ideas of my own. This is one of the two I made. I’ll have more to share on this project very soon and a few gOOd organizing uses for DIYers! 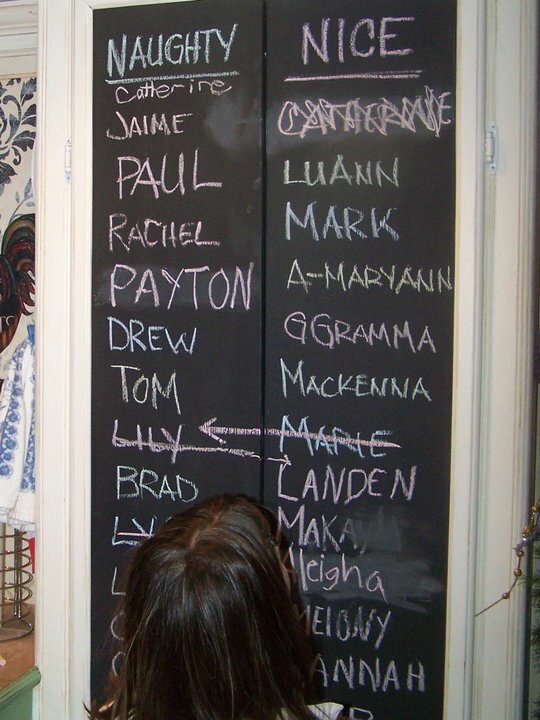 And my last playful copy is this zinc chalkboard found on The Antique Farmhouse. I actually have a vintage farm table with a zinc top that I’ve toyed with cutting up. Toyed with—haven’t done it though. –I have a lot of scraps– so I went that route! And I made a wood template so I could make several. Again—another project I will share soon. I’d like to break it down for you to see HOW EASY this is to DIY! What have YOU seen that you’d rather make yourself? We usually have the landscapers come deal with the Spring and Fall clean ups. Their 3-man crew can knock out the Fall job in about 3½ hours—but the Spring clean up takes the same crew about 6½ hours of tedious work. It’s a bit expensive…but worth it. We decided this year to try to save some money because it’s going to cost sO much to deal with the tree. So we’re trying to do the Spring clean up ourselves—with a little help. We’re almost finished—YaY! Clearly, we’re not as gOOd as the professional 3-man crew—c’est la vie. *The Lilacs were sadly very short-lived this year, but the Irises are gor-OR-geous and make me think of Van Gogh! And now the Peonies are just about to p♥p! This is just one area of Irises! You can see by size it won’t last him very long. But he really wanted it. I also went to see the dance recitals of two nieces…. Now that Summer finally seems to be here -albeit a bit cOOl- I had a hankering for hard-boiled eggs and egg salad! *Who says you can ONLY have colored eggs at Easter!?! I color the eggs all year in beautiful colors! And it’s summer— time for grilled veggies outside! Don’t they look sO pretty?! I love to keep a wide variety cut and at the ready to grill, drizzled with olive oil! I’ve been playing around with a fun chalk board for myself—but I’m stuck. And I think I need some more tiles. Only the upper left down and across is set—everything else is in the works. I’ve been having fun watching a series on The History channel called The History of Slang! Fun-funny-interesting! Ever wonder about some of the weirdest sayings and where they come from-?? Lastly—I got in a 1st bicycle ride—8 miles! Unfortunately my bike needed big repairs from sitting so long in storage, and I just got it back this morning. *It’s gonna take a while to get used to the seat again. And I can barely get in my work shop—it is sO over-flowing. I’ve flown and driven cross-country. Emptied a storage unit—then a truck. Done a flea market. Done a garage sale (in snow even). There’s been 2 funerals a wedding and a confirmation. And–I’ve chased “locally” about 1,000 miles up and down the highway doing family things…. ….so I was late turning in my test results for a glue trial I was participating in. Here’s one of the littler projects I tested that glue on. I made these chalkboard signs for the flea market, we also used them in the garage sale….very helpful signage! I made them (literally) from other project leftovers-scraps-cutoffs. I’m juggling a pair of chairs and yard work at the moment, and I’ll have that to show you tomorrow! A glimpse of the Naughty & Nice lists! and the Naughty list was quite lengthy—LOL! But, soooooo many “arrows” and “re-writes” later, the NICE list grew exponentially! the “big kids” just didn’t get caught on camera! By the end of Christmas day, the board was just barely legible! Hey, now—how did I get kicked off again. . . ?